I am truly proud of my family, recognizing the struggles my parents had in providing for ten children. There is a diversity among us that oftentimes has seemed insurmountable, in that each of us is so exasperatingly different. My Dad worked hard to provide for us, and worked even harder still to build up the house which I now currently own. I have come back after so many years to live in the same house that I grew up in. All of the rooms reflect my Dad's handiwork, with some assistance provided by myself and two of my brothers. There are many memories here, of both Mom and Dad, along with what it was like to be one of ten siblings. My Mom was also a truly gifted person, passing her days as a housewife, mother, cook, artist, teacher, and Church-goer. She passed away in January of 2001, but is remembered and loved for the joy and memories she provided. Mom was Tex-Mex from Pendleton, Texas. Her parents came from Mexico and spoke only Spanish throughout their lifetimes. It was through her that we gained our own sense of being "mexicano" and the culture, the food, and the language that are so deeply ingrained in our being. Dad is half Mexican, half Czech. 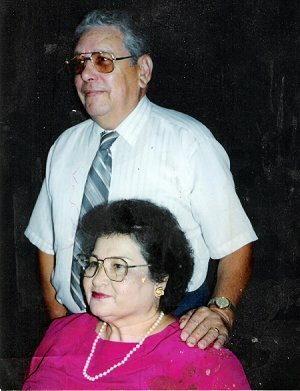 His Mother was of Czech origin, and that influenced our lives to a degree, in that we listened to the "Czech Melody Hour" every Sunday - which was broadcast from Temple, TX, where I was born. Mexican dances, piñatas, making tamales, church bazaars (jamaicas), six sisters and three brothers, Sunday visits to Grandparents, umpteen Aunts and Uncles, and even more cousins! These were all a part of the heritage I enjoyed as a result of my parents' being. Up times and down times, family always came first. Spanish here, English there, and A Ja Sam Sunday afternoons. Thanks Mom and Dad, for all you did for us. And special thanks for always encouraging each of us to simply be who we are!